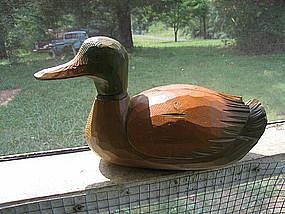 Vintage wooden duck measuring 11 1/2 x 7 x 4 inches. It is not one piece, but has a screw on head. Some wear to the finish and possible nick on the tail. It is difficult to if it is damage or just the way it is made. Complete condition photos by email. I need your zip code to calculate the postage.